The biggest album release so far this year for me personally dropped today. 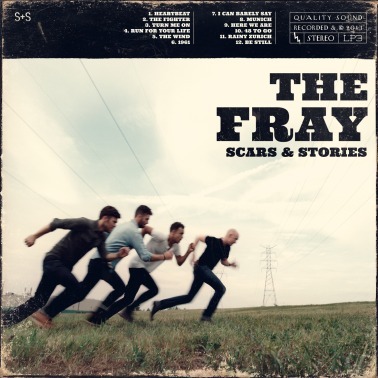 The Fray released their third full-length album today titled "Scars & Stories". I was excited to find the entire album's worth of songs available to stream and preview today on Grooveshark. Good music just makes the work day go smoothly! The Fray have a knack of creating music that just gets stuck in your head. Not just lyrically, but the beat always seems to play on. Ask most people that own a radio and they could sing you the chorus of "How to Save A Life" on the spot. Time will tell if they score another huge smash from this album, but their first single release "Heartbeat" is a solid contender for massive radio play. There are many other songs that could also garner a lot of attention, but I personally had the song "Munich" playing on repeat today. Anybody else have a favorite track from "Scars & Stories"? Leave a comment below! If you haven't had the opportunity to listen to any of the new album yet, you can stream the entire album using the widget below. If you're like me, you'll let it run all day! The band has also debuted a newly designed website. Check them out at http://www.thefray.com/us/home.